I think we have all heard we sleep approximately one-third of our life. That sounds about right as the average person gets about 8 hours of sleep a night, which is one-third of a day. If you are among the percentage who sleep well throughout the night, you are a lucky person! According to sleep experts, at least 30 percent of us have trouble sleeping at least once a week. There is 15 percent who have more difficulty sleeping at least 3 nights per week. This can be attributed to several factors including insomnia, a partner snoring, night sweats or night chills. If you are in the latter of this grouping, you may fluctuate between being hot and being cold at least once per night. So you may turn a fan on or off, pull the bedding up or off or any number of things to get comfortable. Sadly, more often than not, none of these solutions quite hit the nail on the head and we lose even more sleep. What if I told you there was a product on the market that can easily change the temperature in your bed with a simple flip? Well, the Duovet dual temperature duvet will change the way you sleep! If you sleep alone or sleep with someone, chances are, you will wrestle with the temperature in the bed. If you tend to get hot at night and then sleep with someone, that just adds to the temperature in the bed. On the other side of the proverbial coin, if you get cold at night, it can be hard to get warm. It seems when you pile more covers on yourself, you just feel weighed down instead of nice and toasty. Who can sleep when they feel like an elephant is taking a nap on their body?! With The Duovet dual temperature duvet, you can change the way you sleep by changing the temperature in the bed. I received The Duovet and with its two different temperatures, you can get a great nights sleep. One side of the duvet is nice and cool while the other is nice and toasty. If you are feeling too warm, you just give it a quick flip to the cool side and you are back to sleep before you know it. If you are feeling chilly, you would just turn it over to the warm side. 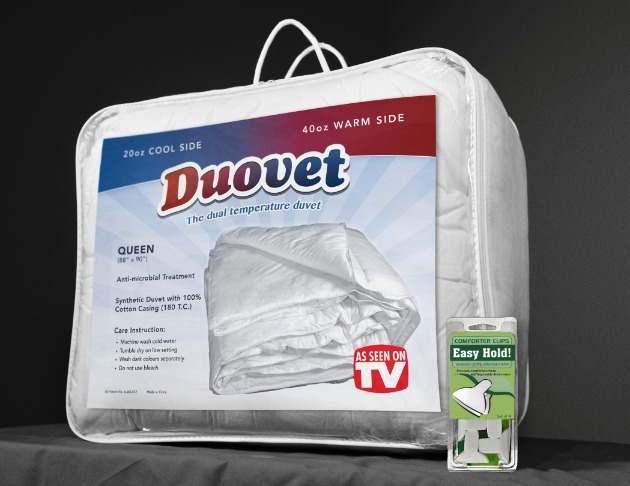 The Duovet is filled with 40 ounces of microfiber filling on one side to keep you warm while the other side has 20 ounces of microfiber filling to stay cool. The Duovet comes in a queen size which will give you a 14″ drop on either side, but will work on a king bed with a 6″ drop. You can purchase The Duovet online from their website for just 3 payments fo $24.99 and there is a one year money back guarantee if you are not completely happy with your Duovet. It’s freezing here in the big apple, I have a wood stove to help because we have electric heat and rarely use it $$$$$$$$. This would be amazing. This is perfect for me because I am always cold at night & my husband he likes to be cold, so this would be perfect for the both of us LOL. This is really neat. I def can use this. I accidentally checked I follow you on Pinterest and I can’t reverse it!!! I don’t have a Pinterest account!! !